I’m on the home stretch (pun unintended) with the cabled socks. I just have to finish up the ankles, do the ribbing and bind off. Yea! I have turned the cables twice on the ankles (6 or so turns to go), and I’m happy to announce that they are fitting very well! And the small changes I made are almost imperceptible. Yea, again! I think I’ll go back to the 3.0mm needles for the ribbing. Ever notice how cables really draw in the fabric you are knitting? Ever notice how yarns with high silk content just don’t have that much give? Ever notice how Alpaca just isn’t as springy as wool? Ever notice how that sock I just completed the foot of fits pretty darn well with only 1/2 cabled? Do you see, gentle reader, where I’m going? Oh, yeah… I turned the cables on the ankles for the first time, and suddenly the socks stopped making it easily over my heel. Oops. 1) Frog them all out and start over with larger needles and/or a different pattern. 2) Try larger needles on the ankles and see if that makes enough difference. 3) Add a third purl stitch between each cable (8 stitches total). 4) Put a lace panel between the cables. I threw out #4 right away because I think it would look weird if the lace was on the ankles but not between the cables on the feet. I probably should have gone with #1, but May approacheth and I have many other projects screaming for attention. So I went with both #2 and #3. I’m just about to turn the cables for the first time (again) on the ankles. Keep your fingers crossed. I’m also open to other suggestions. I want these socks to be nice for my sock pal. I also want them to be actually wearable! I never wear my watch when Iâ€™m at home. But there are a couple of audible clues as to the time. My computer speaks the time at the hour and Â½ hour: The time is now two thirty p m. It speaks only from 6:00 AM to 11:00 PM. And I have a mantel clock. It used to be in my motherâ€™s house, but since she passed away it has lived with me, faithfully chiming the hour and Â½ hour in a sonorous voice that makes it sound much bigger than it really is. Visible from the living room, kitchen and family room, itâ€™s always the clock I look at when I need to know the time. If I was in a different part of the house, I listened for its ringing. Day or night, it could be counted on to, wellâ€¦ count. Last week the mantel clock did not chime. Its hands are stopped at 8:35. At first I thought we might have had a power outage that made it lag behind (itâ€™s an electric clock). But, no, itâ€™s really stopped and chimes no more. And this is the excuse I use for why I was up at 2:00 AM this morning, turning the heels on socks. Yes, I realize that the fact that I was watching TV, and even changed channels several times, should have been a cue that it was getting late. 8:35 the clock said, as The Apprentice ended. 8:35, the clock said, when I glanced at it as the 11:00 news came on. 8:35 the clock said, when I finished turning the first heel and started on the second. 8:35 the clock said, when I realized Iâ€™d seen this Conan before, and switched over to American Hot Rod. 8:35 the clock said as I finished up the second heel flap. 8:35â€¦ Oh, my, itâ€™s after 2:00 AM! Oops! Yes, yes, I do tend to watch some inane TV when focused on knitting. I admit it. But there was nobody home but me and the cats and nothing else that needed doing. And I wanted those heels turned! To all of you who think that Iâ€™m completely daft because this is a perfectly â€œnormalâ€ heel: Itâ€™s not a new heel, but itâ€™s new to me. I do like the way that it looks, too. All of the increases are hidden along the first heel stitch row, so thereâ€™s no short-row line. And you can see that it fits well, too. Itâ€™s just slightly long on my foot, so I think it should fit my sock pal well. The cables pull the fabric in, but not too tightly. So, again, it should fit well. You might notice that the Addi Natura I was using after breaking one of my ebonies has been replaced by an Addi Turbo. It appears that Addi and Suzanne are the only ones that make 3mm needles. It’s hard to tell from this picture, but the Addi’s are only about 3Â¼” long. The Suzanne’s are more than 5″. That’s just a little too long to be effective for sock knitting. As much as I love these needles, I will be knitting other things with them from now on. 64 stitches total around sock, 32 stitches on sole needle, 30 of those involved in the heel. 9 st increased on each side for the gussets. 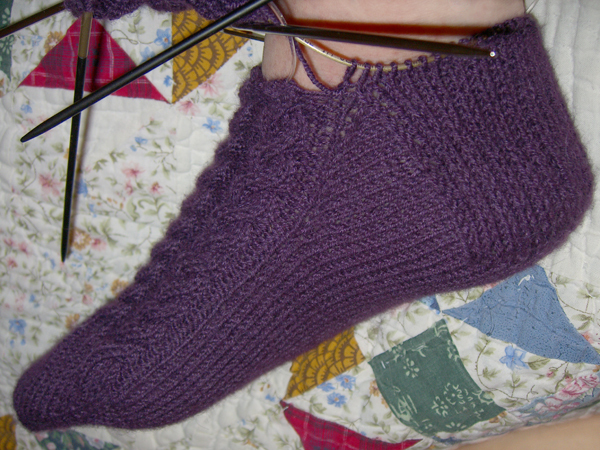 The heel was worked over the center 16 stitches. On each row, I slipped the first stitch, worked one less stitch than the prior row, and did an M 1 increase at the end. The last row I worked had 3 stitches plus the slipped stitch. This increased the heel flap stitches from 16 to 31. 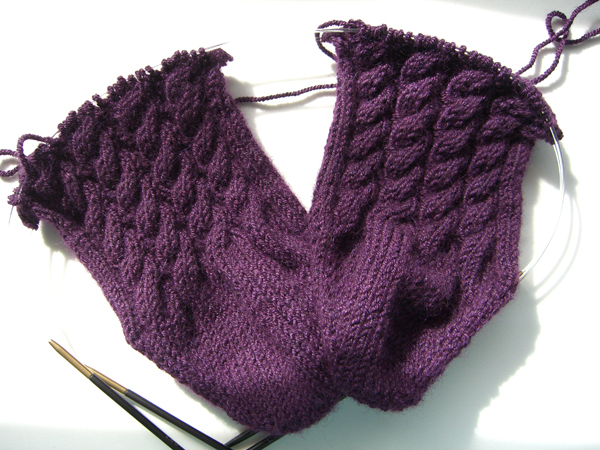 From the last M1, I knit across to the first gusset stitch and did a SSK to meld heel flap to the gusset on the knit side. 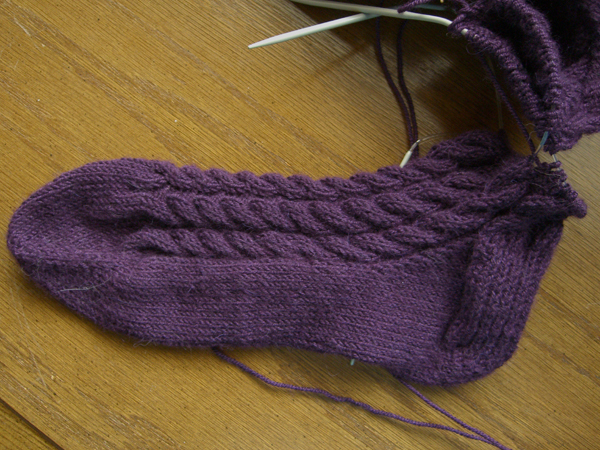 Then I turned and purled across the heel flap row and did a P2Tog to meld the heel flap to the gusset on the purl side. I switched to Heel Stitch and worked back and forth until I had picked up 16 gusset stitches (the 9 increases plus 7 sole stitches) on each side. That left 33 stitches on the sole needle. So the next time around, I decreased by doing a P2Tog right in the middle, hidden in the purls between the cables. I like the way this looks and fits, and I will definitely use this heel again. I will try not to turn it at 2:00 AM. But no promises. I need to get my mantel clock fixed! 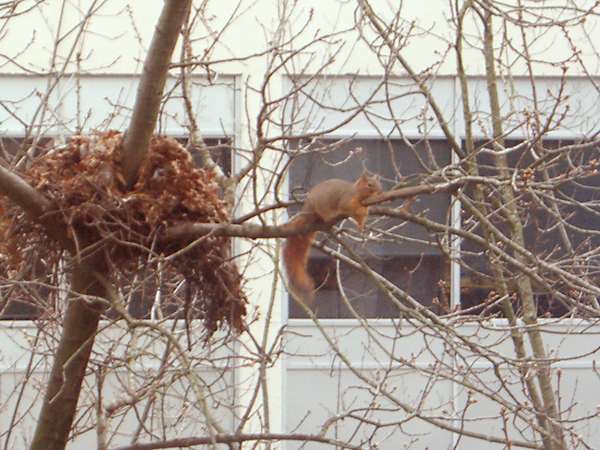 This squirrel was lounging in the tree outside my work window. She (he?) looks like a lady of leisure, doesn’t she? She (he?) wasn’t much in evidence all winter, but now that spring has nominally arrived, she has been rooting around in her old nest and stirring things up. I’m fairly certain this is the squirrel that nearly attacked me the other day when I came between it and an old acorn lying on the ground. I think she looks a little plump. I’m wondering if there will be little squirrels in the nest soon? That will be fun to watch. Last spring I sat in a different location, so I haven’t gotten to spy much on the squirrels. I have watched birds nest, though. The sun came out today for 10 minutes – a rare occurrence in springtime Portland – and I managed to get a decent picture of the sockapaloooza socks. This is still not quite the right color, but I think it’s probably as close as I’m going to come. Digital cameras do not seem to deal well with purple. At least the cables show. 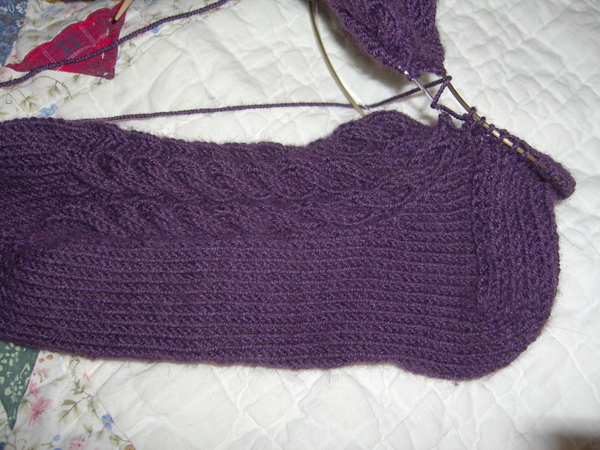 I’m a little further along than this now, having just started the gusset increases. I had to stop and test swatch the heel. The 60-year-old Beehive instructions aren’t like any other heel I’ve ever worked. And, since I’m working everything upside down and backwards, I had to swatch it twice before I came up with something that’s a reasonable facsimile of what’s in the picture. 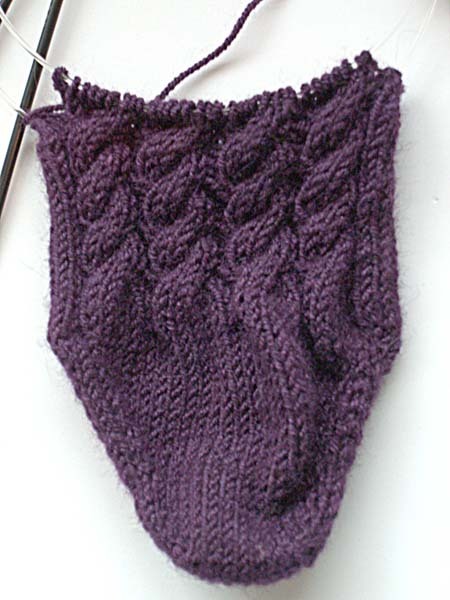 Now that I’ve worked it once, though, I like it and I think I might work the same heel on Tangle’s birthday pattern. 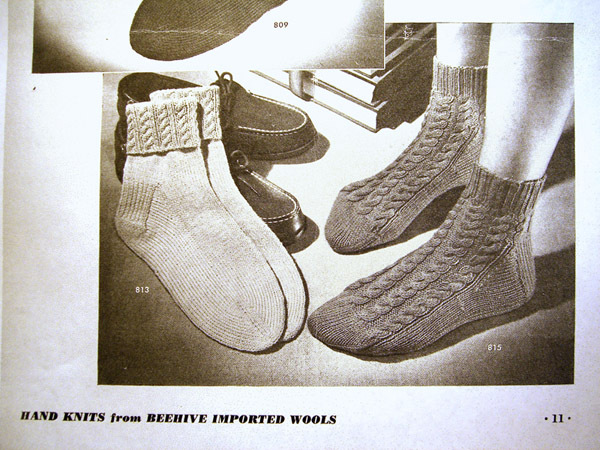 I searched through Knitting Vintage Socks by Nancy Bush because that book has a ton of different heels and toes in it. But none of the heels that Nancy Bush shows resembles the heel in the Beehive instructions. So I am henceforth dubbing it the “Beehive Heel.” It’s really a cool technique that uses decreases (or, in my case, increases) instead of short rows. Strange, but very round and nice looking. I think it will be comfortable to wear. I can’t wait to get one finished on the Sockapaloooza socks so I can try it on. Isn’t it hard to type when your keyboard has a big, fluffy kitty tail draped across it? Kidd is taking a nap on my desk and insists that is the place his tail must be. Although I’m trying to avoid it, I don’t have a lot of sympathy if I accidentally pull a few hairs that happen to be lying on my keys. I have encouraged a different tail placement, but Kidd disagrees vehemently. Just to prove that I have been working on my Sockapaloooza Beehive socks, here’s the latest picture. Yes, I realize that they’re not as far along as one would wish. But after all I did stop to knit four cupcake hats and get ready for the sock class (a continuing effort). This yarn is extraordinarily hard for my digital camera to handle. In real life it’s the most beautiful dark plum color. If I could take a picture on a day when we have sunshine, I might be able to capture it. But, on a cloudy spring morning, this was the best that I could do. You can just see my new ebony Suzanne needles in the corner. I’m finding that I knit tighter with these needles than usual. Actually, I knit fairly tight anyway, so with the increased tightness my gauge is almost too tight. I tried these needles with wool first and found that they grabbed the wool too much. But with this slick alpaca/silk/cashmere blend they hold on just right. I’m wondering if others also find that they knit tighter with these needles? My naked Inox grays were seduced by the dark side this lovely Blue Moon Socks That Rock in colorway Alina. Isn’t this yarn yummy? It doesn’t look anything like I thought it would. In the skeins, it looks like there is more blue and green than yellow or orange. When I wound the balls on my trusty nostepinde (I’m a hand winder), I could see that it was actually more multicolored and bright than it had looked. 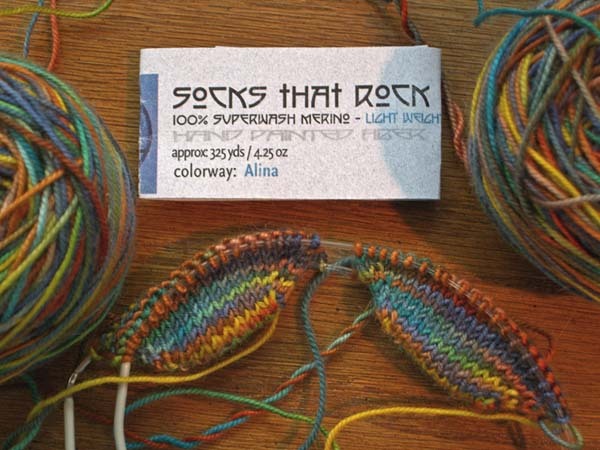 The Socks That Rock repeats are so short that even on the toe rows the multiple colors blend beautifully. I can’t wait to see what this looks like once I’ve increased to the ends of the toes. But I will wait, because I don’t want my sock pal to wait for the Beehive socks. I will have them done soon! But I can’t wait to get back to the Alina. This yarn has a very special date with destiny!